Non ci sarà più alcuna ristampa invece per Bar Torque, l'album di Elton Dean e Mark Hewins che nel 2001 inaugurò le pubblicazioni di MoonJune Records. Lo annuncia lo stesso Leonardo Pavkovic, invitando a procurarsene una copia prima che sia tardi: "This CD presents an improvised duo setting with guitarist Mark Hewins, a longtime partner with a remarkable talent for atmospheric accompaniment. 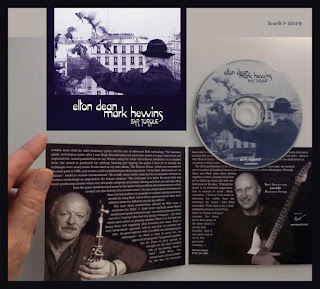 The music on this release focuses on the most lyrical dimension of Dean's saxophone playing, with melodic outbursts inspired by and buoyed upon Hewins' delicate, dreamy, harmonic foundation. The aural path treaded by this uncanny pair of musicians is playful, unpredictable, and thoroughly original. Abstract but not amorphous, Bar Torque is improvisation at its most touching and universal. This will appeal to fans of alternative rock/pop, electronica, experimental and otherwise esoteric styles, and, of course, jazz and progressive rock."